Are You Scared to Follow Your Calling? I sat awkwardly on the wooden pews, my curiosity peaked by the white screen positioned front and center. The women in my church sang her praises without end, claiming she was the greatest teacher in the Baptist world of women teachers (I had no idea that “world” even existed.) I had never seen this “Beth Moore” in action, but I was intrigued. Now, as I sat counting the tiles on the ceiling, I wondered if this woman’s teaching was as life-changing as they all claimed. Within the first 5 minutes, the eyes of my heart were glued to the larger-than-life image suspended above the baptistry. Who was this teacher, let alone a woman, speaking with such authority and passion? The depth of her knowledge and passion for God’s Word left me speechless. I had never seen a woman teach like that. Before you think me a sexist, let me explain: My church only had men speaking from the main stage. 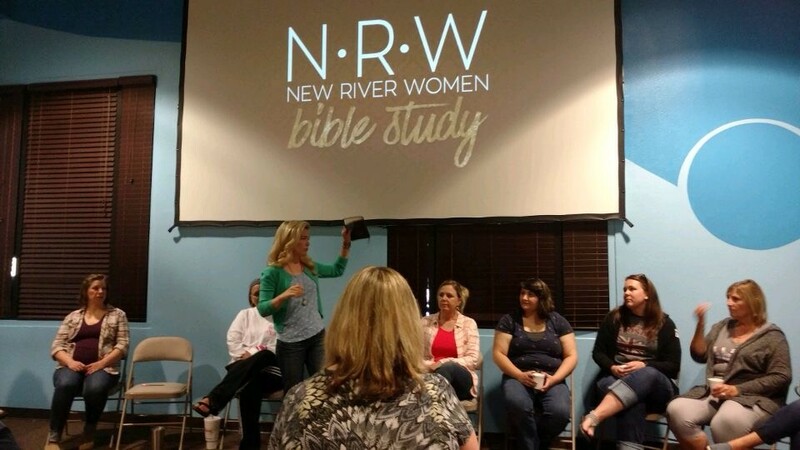 I had always wondered what it would be like to sit under the teaching of woman outside of Bible study. Here was Beth Moore, preaching to thousands. I knew God created a desire in me to preach His Word- it just comes ALIVE to me- but I didn’t know how that would ever look,or if it was even possible in a context outside “Women’s Ministry.” But here she was, carrying the mantel for me as a female leader- bold and empowered, her heart on her sleeve. A passion stirred deeply in those 45 minutes. My eyes were opened to a future that I didn’t think possible. Beth Moore became a launching pad for seeing ministry in a brand new context. She was not only a teacher, but her faithfulness to be active in her calling inspired me to live out mine. Fast-forward twelve years and here I am, relentlessly chasing that calling. I put my fears and pre-conceived notions to the side and followed God into the unknown. Ladies, we are a gender full of passionate Christ-followers who are trembling at the thought of doing what God has commissioned us to do! It is the biggest weapon the enemy uses against us, to silence us and keep our effectiveness for Christ at bay. What if we fail? What if we succeed? How do we recover if we fall on our faces? There is someone out there who needs to see you doing what you love. They have never seen anyone do it before and are scared to step out. They need validation that what they are feeling isn’t silly or made-up. Women DO have a calling! If I had never experienced that moment in a musty church where a WOMAN taught the Bible with such authority, I may have never felt permission to follow God the way I do! Someone needs to see the way you mother your kids. They need your insight and experience. They need someone to be honest with them about the struggles and the triumphs. They need you to share how you started your business, where you found your best recipes, how you reach out to the homeless- other women NEED to see you living out your calling! Inspire the next generation, your best friend, your elders to be brave and take a risk! Our story is so much bigger than us. It is part of the story God is creating for others. When we unlock the potential God has placed in us, things supernaturally shift. It is immensely bigger than our hang-ups or worries. We are each other’s support system! Who are you to NOT experience the best God has planned for you? When my daughter is coloring, she loves to layer crayon colors and ask, “What color did that make, Mom?” She loves the newness that she creates when she combines two different things. What if we all brought our own color to the table and allowed God to mix and layer us all to establish a color the world has never seen? Your are the only one with your color- your voice, your imagination, your quirks. Don’t leave your vibrant life out of the mix! The world doesn’t need more of the same ol’ thing. They need fresh insight and open doorways where there were once walls. I am struggling just to learn what my calling is. I love this story. I keep thinking he isn’t revealing it because I am not ready to “step out of the boat” and that leads to whst am I doing wrong and thoughts of unworthiness… Bla bla! The enemy I know! I have been a Christian for about 4 years. My testimony has a lot of ups and downs in that regard but I am committed and learning and growing for 4 years. So I keep thinking I should know how to hear him by now and whst I am suppose to do besides babysit 2 beautiful grandchildren all day and work till 2 or 3 am at night, and struggle to sleep and make time for the Lord and myself. I can’t start doing if I don’t know what I’m doing! Sorry for rambling. I love Beth Moore by the way. Got to go to a weekend of sessions with her last August. She will definitely help you see thatvyou want a calling, even if it’s just to learn the word. Thanks for reading this.